Residents can now have their say on the 42-mile stretch of Natural England’s coast path which includes the Christchurch coastline following the launch of a consultation on the proposed route. A coast path consultation which includes the section of The England Coast Path from Kimmeridge to Highcliffe has been launched by Natural England. Natural England, the government’s advisor for the natural environment, is responsible for implementing the Marine & Coastal Access Act 2009, which requires them to secure a route around the whole of the English coast for the public to enjoy. It is hoped that the coast path will be completed around England’s coast by 2020. Once complete it will be one of the longest coastal walking routes in the world. Having recently identified their preferred coastline route in Christchurch, Natural England is now formally consulting with the public and landowners on their proposed route. The route would see existing coastal rights of way formalised on a map and waymarked without any new pathways being built. Much of the route in Christchurch is on public open space, promenades or beaches owned by the borough council. Only landowners, tenants or occupiers of affected land can make a formal objection in response to the consultation and must do so on the form provided. The borough council will be responding to the consultation in its own right as an affected landowner. The council is unable to accept letters or emails from the public as it is unable to forward feedback. Members of the public wishing to comment on the route must do so by completing a separate representation form and returning it to Natural England by midnight on 16 August. 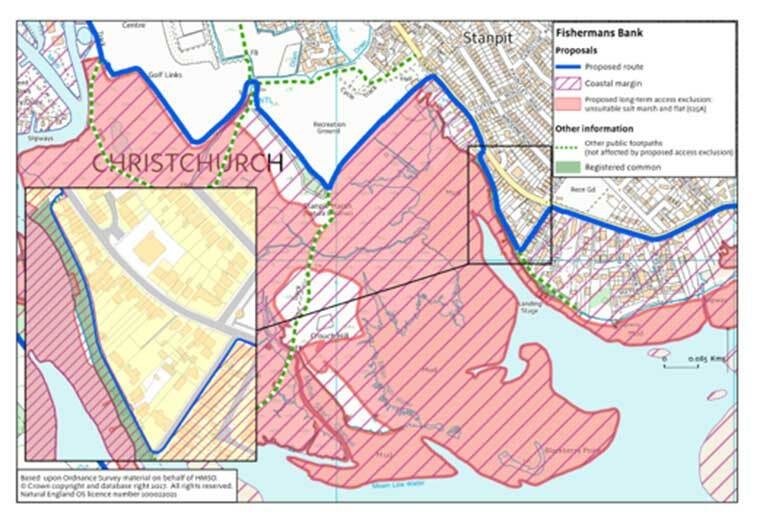 The consultation, along with objection and representation forms, is available online https://www.gov.uk/government/publications/england-coast-path-from-kimmeridge-bay-to-highcliffe-comment-on-proposals and hard copies of the consultation and forms are also available to view at the Civic Offices, Highcliffe Library, Christchurch Library and the Christchurch Tourist Information Centre. The consultation will be open until midnight on 16 August.